I thought a good way to get back into blogging and introduce new readers to my pony self would be to do a 30 day challenge. Plus let’s be honest, I need a schedule to get back into a blogging routine. I grabbed this list from Viva Carlos after spending what I think is a solid afternoon reading her old posts (this is without saying, my favorite horsey blog btw!). I started riding when I was ten years old after being obsessed with horses my entire life. I think I would have started much earlier, but apparently I was also obsessed with figure skating and all of my free time from ages 5-13 was taken up with skating lessons and competitions before and after school. Sometimes I wonder if I’d be a lot better if I skipped the skating entirely and went straight to horses – but I digress! There has never been a time in my life when I don’t remember loving horses, so that’s essentially the reason as to why I started. I’ve just been drawn to them. When I was in Kindergarten, I tricked my teacher into thinking I could read because I “read” Fritz and the Beautiful Horses to our entire class. Only I didn’t read it, I just had it memorized and was telling the story to my class. 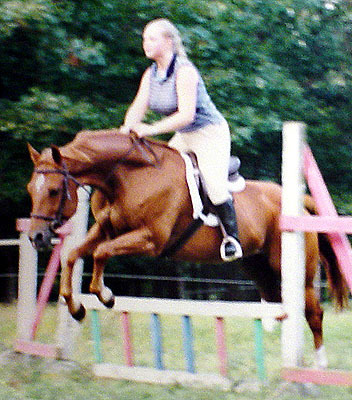 Me using some very bad judgement jumping my then green horse without a helmet. This is the ring I learned to ride in, just many years after my first lesson. I stayed at Judy’s barn until I was 18, when I went to college, joined the IHSA team and realized how much bigger the horse world was. I wanted to do more showing and ride at a place with better facilities that was closer to where I lived. It was the right decision, but I felt so guilty about leaving her. She taught me so much. To this day, I am thankful for the horsemanship I learned there. There was no huge emphasis on equitation (besides how to equitate well enough to stay on!) or ribbons or the intricacies that I love about the hunters… but I learned to always keep your horse first. How to groom properly. How to rehab from an injury. How to trailer. Safety, safety, safety! Those lessons are immeasurable, and I think often over looked at large lesson/showing barns today. Dude, you totally made my day. Thank you so much for enjoying my blog! I look forward to reading the rest of your 30 day challenges et al. I loved Fritz and the Beautiful Horses!! It was one of my favorite books as a kid. Also, beautiful picture of you!